Happy Friday everyone! It's been a while since I put out a round-up post (misleadingly labelled as a "fortnightly" round-up, hem-hem), so here goes. Eat Drink Man Woman, the all day eating house that opened last year on Brunswick Street in the site that used to be Retro, traded for a bit over six months before closing. 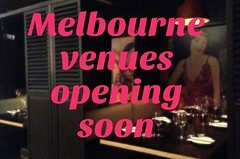 After a bit of a rethink, the EDMW team are renovating and reopening the venue as a burger bar (yep, another one Melbourne). 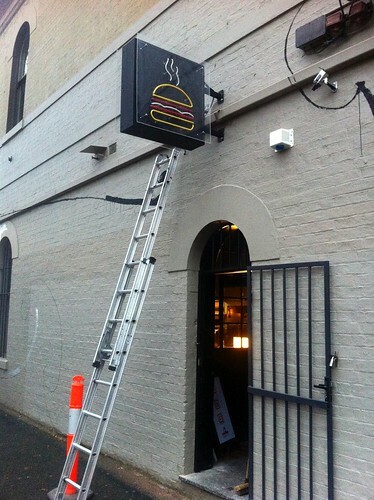 Judging from the neon sign being installed last week, the burgerfication process is nearly complete. It's been a few months since my first taste of the yum cha menu at Spice Temple, but I went back a few weekends ago with my family for my brother's birthday lunch. Very impressive (those braised lamb shoulder pot stickers, my God). Someone asked me online whether I thought it was better than traditional yum cha in the suburbs, and I have to say that I don't really consider the two experiences comparable - it's a completely different concept, quality of produce, price point etc. That said though it was less expensive than we'd anticipated (less than $70 a head with beers, two bottles of nice Pinot Noir and Rumpole getting carried away with ordering dishes). My love affair with The Moor's Head continues. They now have a banquet option which is insanely good value at $25 a head. 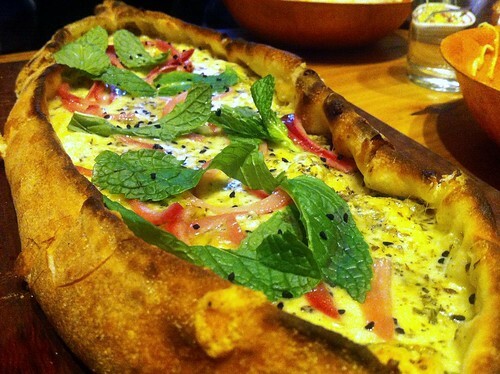 When I visited last week I particularly enjoyed the little radishes sprinkled with black salt, and the Omar Sharif pide made with three cheeses (twisted halloumi, feta and ashawan), nigella, fresh mint and soused onions. 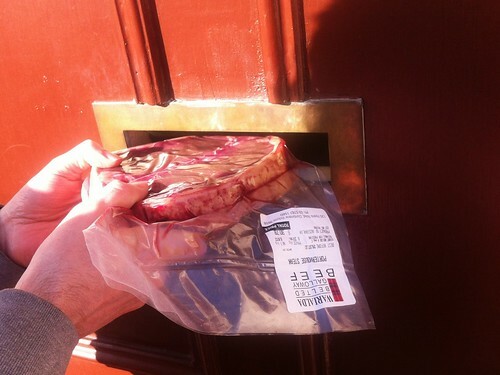 If your friends aren't home, we recommend simply posting the Warialda Belted Galloway beef you bought them at the farmers market through their mail slot. :) Congrats by the way, Warialda, on winning a medal on Monday night at the Delicious Magazine Produce Awards! Gratuitous comfort food shot, home cooking edition. 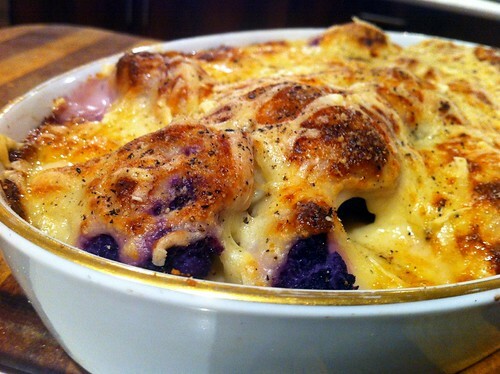 Cauliflower cheese made with purple cauliflower > cauliflower cheese made with white cauliflower. 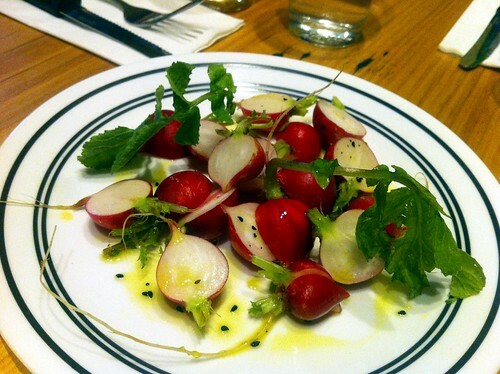 Last week I was invited along as a guest to a dinner at Heirloom. They've ditched the French-Japanese fusion concept that they opened with last year (I dined there once under its former guise, and didn't think the two cuisines sat well together) in favour of being a modern izakaya, headed up by Executive Chef Ryo Kitahara (direct student of Iron Chef Hiroyuki Sakai) and Chef Shigeo Nonaka (Shoya). 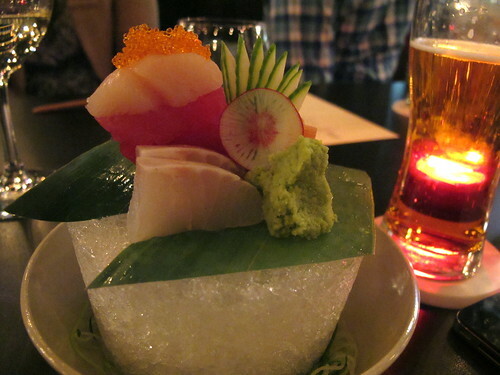 I'd enjoyed the more Japanese aspects of my meal on my previous visit, so I was curious to see the new incarnation. While I really loved the sashimi plate (theatrically served on a big block of ice), the yakitori and the tataki, I was less taken with some of the more creative dishes, like the potato dango (cubed Japanese 'gnocchi' with Roquefort cheese and Saikyo miso cream) or the sweet, quinoa-crusted salmon. 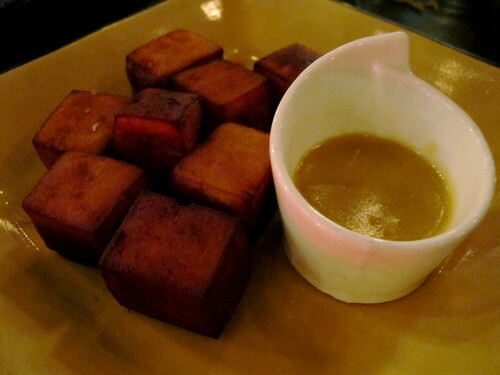 What can I say, I prefer simple izakaya fare. They also have a good range of sake, shochu and Japanese beer - I tried one from Coedo, a microbrewery in Kawagoe-shi, Saitama Prefecture. 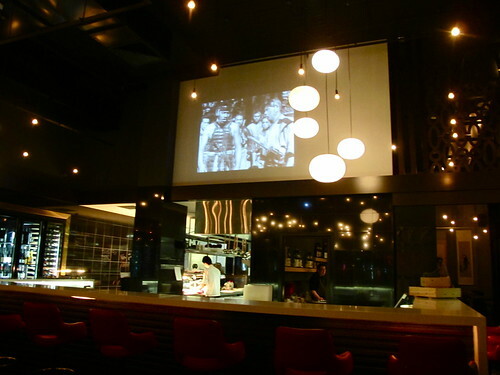 There's been a lot of buzz in the three weeks since Silo by Joost opened in Hardware Street. The cafe, run by hospo stalwart Danny Colls (most recently, you'd know him and his wife Siany from Liaison), translates many of Joost Bakker's sustainability concepts from the Greenhouse incarnations that you've seen pop up sporadically in Melbourne, Perth and Sydney, and house them in a permanent cafe that creates zero waste. Read about how they've achieved that feat here: Danny gave me a tour on Tuesday, and as well as all the nifty tweaks they've given the interior (including the modified Wega), the food waste dehydrator they've got out the back that turns 100 litres of waste into 10 litres of clean, nutrient rich dry fertiliser returned to farms is very impressive. But what I hope doesn't get overshadowed in amongst the sustainability jazz is how deft and interesting the food is, thanks to chef Douglas McMaster who over the last two years was a stagiaire in nine of the world's top 15 restaurants (including St John and Noma). 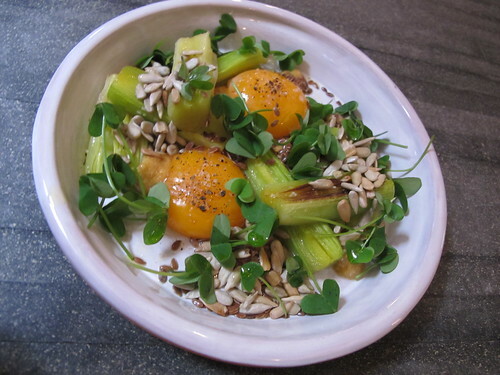 From the short, simple lunch menu I chose one of the cheffier combinations: the $12 plate of braised leek, slow-poached egg yolk and seeds (mustard seed dressing and sunflower seeds), which I mopped up with bread made onsite from flour ground onsite. 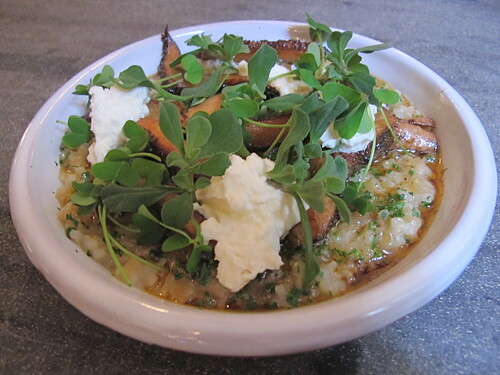 My lunch date had Sian's rainfed rice, which had been cooked in stock and topped with pine mushrooms, curdy quark and wood sorrel ($14). They'll be running intimate dinners soon too - if you want in on the action, get together 10-12 friends and talk to Danny. Last thing before we get to the links of note: the Electrolux Appetite For Excellence national finalists have been announced, and there's a good representation from Victoria in the categories of Young Chef (Kah-wai Lo from Hare & Grace, Michael Fox from Henry & The Fox, Michael Demagistris from Sorrento Golf Club), Young Waiter (Simone Spicer from Pei Modern, Pierre-Etienne Geoffroy from Jacques Reymond, Damien Byrne from Lot 7) and Young Restaurateur (Dan Wilson from Huxtable). A Whet Your Appetite dinner put together by these young chefs and yound waiters is being held on the 31st of July - click here for details. - A voice sorely-missed from Melbourne's food blogging scene over the past two years, Eating With Jack is back from hiatus and writing a food blog about her baby Z's first forays into eating solids (taleggio and eel at 18 weeks!). - Next time you hear people complaining that the burgers at Huxtaburger or Trunk Diner are too small, bear in mind that burgers have tripled in size since the 1950s. - Read about Gillian's misadventures making a cake from the Australian Women's Weekly Children's Birthday Cake Book (hint: a cat is involved) on My Square Frying Pan. - Billy writes about the Footscray gentrification trap on Half Eaten. - The Naked for Satan folks are building a gigantic rooftop garden and they're blogging the construction process on a blog called Naked in the Sky. - My aunt Paola is currently visiting our Italian relatives in Friuli Venezia Giulia, and she's driving me crazy with jealousy as she chronicles her trip on her blog Italy on my Mind. See her beautiful posts on breakfast with zio Livio in Monfalcone and a seafood lunch in Grado. I haven’t worked for x amount of years and pushed myself hard in order to put a bloody chicken Caesar on my menu. The accountant looks anxious. 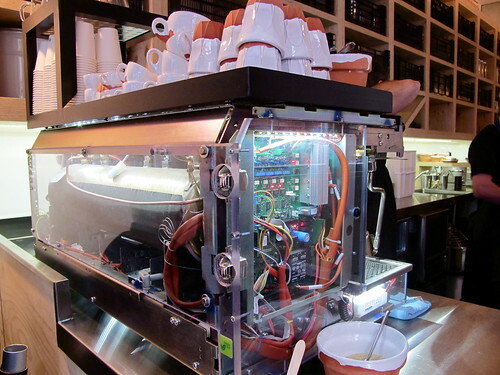 My point is: Is the safe choice always the best one? Chef Steve Cumper puts his serious face on for a moment and writes on The view from my porch about the recent spate of restaurant closures. - Ai-Ling finds the best bánh mì in Perth on Blue Apocalypse. 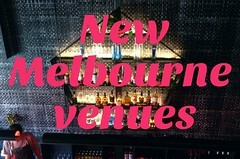 - Read about how the design and branding of Melbourne newcomer Patricia Coffee Brewers was developed on Identity Designed. - In the first Fortnightly Round-up that I wrote in November I mentioned the food policy that was being developed by the City of Melbourne. It has now been published - check it out here. Oh I am with you all the way re The Moors Head. And how brilliant is the banquet for $25? Obscene! Agree with you about Spice Temple. 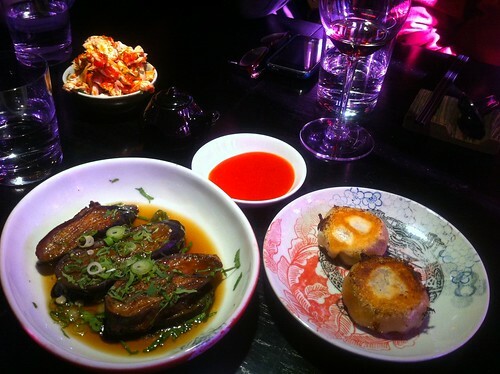 I love their zodiac cocktails and we always order the pork/tofu "lion's head" meatballs. Quality place. THANK YOU for telling me of the banquet at The Moors Head - another superb recommendation by you! :-D I took my friends there a while back when you first wrote about it and we were all extremely impressed. And now banquets! $25 banquets! Yes please! Wrote to the buddies again and going to convince them we should re-visit. Yay! That burger sign looks very familiar. Burger Joint NYC.